Golfers come in all shapes and sizes. The big trend in golf clubs is custom fitting - no longer do most companies expect everyone to be happy with the ill-fitting, off-the-rack crap of days gone by. And when it comes to golf gifts, the same philosophy prevails: It seems that every imaginable niche is being filled with products and services geared specifically toward some subset of duffers. Here are a handful of those that have recently come to our attention. With only one exception, we've tested and evaluated them ourselves. After being sold off when Callaway purchased Top-Flite, Etonic has been revitalized by its new owners. 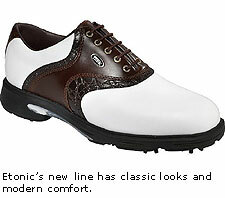 The 2004 line-up features the Stabilite Plus series, with its classy old-school styling and cutting-edge comfort features. I tested the EM9001-4 shoe (etonic.com, MSRP $130), with a white upper and tan nubuck detailing. After walking several 18-hole rounds in them in both wet and dry conditions, I can honestly say they're the most comfortable pair of golf shoes I've ever worn. 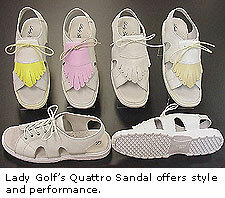 For style-conscious women golfers, Lady Golf (ladygolf.com) has introduced the first-ever line of golf sandals for women . The Malibu Sling (MSRP $90) is the first slingback golf sandal of its kind. Each pair of all-white shoes is packaged with a mint green kiltie embossed with a lady bug; a pink kiltie outfitted with a single-stem red rose; a light blue kiltie featuring a golf club and ball; and a white kiltie decorated with a simple rainbow. The Lady Golf Quattro Sandal (MSRP $90) is designed for performance and color coordination, and includes four interchangeable kilties and shoelaces. I didn't try these out - they didn't match any of my summer skirts. All you fans of duct-tape take note of the new 3M golf glove. According to spokesperson Stephen Fidgeon, the Greptile Grip golf glove (mmm.com, MSRP $12) is the company's initial foray into the golf business. "They're starting off slowly," says Fidgeon, "but they plan to introduce grips a little down the road and expand their distribution. The actual greptile material has been around for a bit now (it has been used on the gloves of professional race car drivers) and has potential applications in a number of other sports." The material, which feels like very fine sandpaper, is a bit crinkly and stiff at first, but works in quickly. It is supposed to grip the club such that you feel comfortable loosening your grip. Neither I nor my guinea pig, er, playing partner, noticed that we loosened our grips any, but the gloves were comfortable and we both played well. The material did make a funny noise when I got it too close to my cigar lighter, though. For the golfer on the go, Cargo Golf (doskosport.com) has engineered one of the most clever and functional lines of travel cases we've ever seen. The major innovation is merging a hard-sided, FAA-approved rolling travel bag with a ready-to-use carry/cart bag. When you get to your destination, just pop off the top, attach the straps, and hit the links. 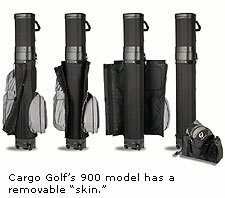 The Cargo Golf ProSeries includes the 500, 700, and 900 models. We tested the 900 model (MSRP $190), and loved the instructions for testing it: "(1) Throw bag on ground. (2) Stand on any part of the bag. (3) Smile." We did just that, and found it to be hard as a rock, but not nearly as heavy as one would expect. You wouldn't want to carry it 36 holes a day, but the dual straps and generous padding do make it manageable for a leisurely 18. The niftiest thing about the 900 model is the removable outer "skin" - all the pockets zip off and can thus be packed separately (if you don't trust the airline workers to not steal your ProV1s). Another nice touch: The strap hooks are all color-coded, so re-attaching them is straightforward. One engineering flaw: When you set the bag down, it lands on the built-in wheels, making it prone to roll out from underneath you when you want it to stand up. Aside from a flimsy zipper-pull that came off almost immediately, the Cargo Golf ProSeries 900 held up perfectly when I shipped it from Massachusettes to Illinois using Sports Express (sportsexpress.com). This company specializes in door-to-door delivery of your clubs, saving you the hassle. Sports Express uses FedEx to deliver the clubs, so I am not sure why one couldn't just call FedEx oneself. Nevertheless, the delivery was fast and the customer service was friendly, although there was some confusion about when the FedEx driver would arrive and whether or not he'd have a label ready. A great help for frequent travelers who like to have their clubs with them but who don't want to schlep them. Finally, for that member of your foursome who tends to - how can I put this delicately? - massage the rules, you might try a subtle hint to knock it off by giving him this outstanding little text. Authors Jeffrey S. Kuhn and Bryan A. Garner have written the first golf rules book that anyone can understand (press.uchicago.edu, $11 paper, $25 cloth). It's a marvel of simplification and indexation. For example, if you hate playing out of bunkers, and usually waste strokes flailing away, consider applying Rule 28.2: According to rule 20.5, you can call any ball in a bunker unplayable, take it out, and play again from where you last played it with a one-stroke penalty. So if you fluff a flop-shot over a green-side bunker, consider a do-over with a one-stroke penalty rather than two to four strokes digging ditches in the sand.